Furi is a good name for a boss rush game that will leave you furious with its extreme difficulty. Or maybe you pronounce it “furry” in honor of the guy in the rabbit costume that accompanies you through the game. In conclusion, Furi is a game of contrasts, thank you. 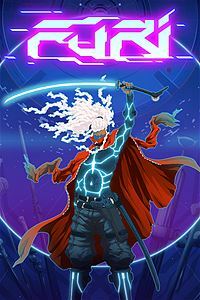 For real, though, Furi offers razor sharp gameplay as you fight through its string of difficult boss fights and features some outstanding presentation, but it is also a good example of something that would benefit by addition through subtraction. A lot of the difficulty and frustration comes simply from the length of many of the fights and a key edit here or there would make the game a lot more fun and give it a wider appeal. For all of the details continue reading our full Xbox One Furi review below. 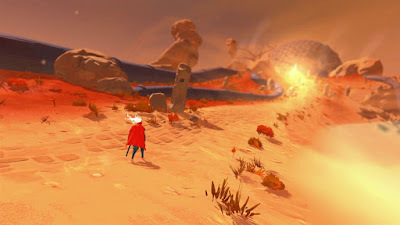 In Furi you play as a mysterious stranger who, along with a guy in a rabbit costume who does most of the talking, is trying to escape from a crazy sci-fi super prison by defeating other prisoners and guards in a series of boss fights (there aren’t any weak minions here) on your way out. What the prison really is, why you were there, who you really are, and more are slowly revealed over the course of the game. The story takes some interesting twists and the main characters are fascinating, but the storytelling method itself is a bit of an issue. Between the boss fights are long, long, long stretches of walking where the rabbit guy dumps exposition at you. You can either manually walk through these slow sections or just press a button to have the game walk automatically while you put the controller down and make a sandwich. While you do see some neat sights (the prison actually has a ton of environmental variety) while slowly walking around and the game does feature some clever cinematography (it actually reminds me of Tarantino’s style a bit in these sections), they are overlong, boring, and probably not the best way to tell the story. They give you a necessary breather between boss fights, but did they really need to be this long and this slow and this boring? The boss fights themselves are, thankfully, a lot faster and more rewarding. Your character has four basic abilities – shooting an endless stream of bullets like you’re playing a twin-stick shooter with the right stick, a quick teleport like Hyper LightDrifter, a sword attack, and a block / parry defensive move. You also have charged up projectiles shots and sword attacks available as well. Learning how and when to use these abilities is the key to victory. 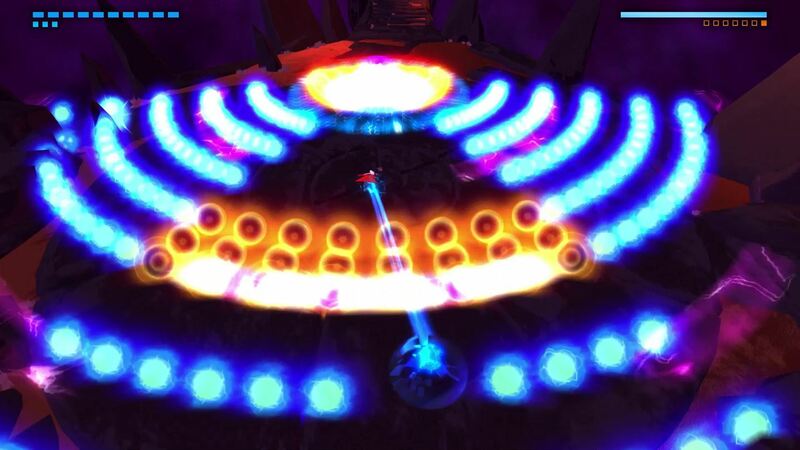 Each boss fight offers its own unique gimmicks and challenges, but they all use the same handful of attacks that include spewing their own projectiles in bullet hell patterns from shoot-em-ups, physical melee attacks that you have to dodge or parry, and energy waves you have to avoid or teleport through. When you whittle a boss down to a certain point, you enter a close up battle where you have to react much faster and be much more precise. The trick to Furi’s bosses is that each one has a different pattern and style of combat and the timing of all of their attacks are slightly different, so even though it all boils down to the same basic stuff with each one they’re all actually quite different in execution. Furi’s other trick is that the boss fights all have multiple phases. Each phase of each fight is different and some bosses have more phases to get through than others. This is where the difficulty and frustration comes in, though. The game relies heavily on memorization of the boss patterns and then pixel perfect execution on your part, which is a nice way of saying that there’s lots of trial and error and dying until you learn the patterns. Then you move onto another boss and have to learn everything all over again. Because the boss fights are so lengthy and drawn out with multiple phases, this process of trial and error can take potentially hours on each boss and I just don’t find that particularly fun. I can say pretty definitively that, for me at least, bosses could have half as many phases and I would have enjoyed it more. Also, because of the way the game is set up, there is no room for innovation or experimentation on your part as the player. You have to perform each move exactly when the game wants you to according to a pattern and if you don’t play by the game’s rules, it’s game over. In this way it’s more akin to Dance Dance Revolution or Guitar Hero than a similarly difficult action game like Dark Souls. Dark Souls lets you use a hundred different strategies and techniques for every situation. Furi just gives you one and you’d better execute it perfectly or else. There is definitely a great sense of satisfaction in Furi when you do beat a boss, but it is a different sort of satisfaction than other notoriously challenging and difficult games offer. I like games where you can apply what you have learned and beat a tough encounter on the first try based purely on your skill level as a player. Furi changes the rules in every new fight so you have to throw out what you’ve learned and figure out the patterns all over again. Satisfaction from applying your own skills or satisfaction from executing a script are two different things. I’m not saying that’s bad, but just not necessarily what I’m looking for. Your mileage may, of course, vary. The presentation in Furi is pretty stunning all around. The game has a tremendous variety in the environments you walk through and fight in and it all looks absolutely fantastic. It also runs at a rock solid framerate as well, which is important considering the precise timing required. I really love the soundtrack too as it covers a wide range of styles – with an electronic / synth base – that mesh well with the variety in the levels. The voice acting is also well done, particularly for the rabbit man. I hope you don’t mistake my tone in this review as me thinking Furi is too difficult. That isn’t the case at all and I think my track record on other notoriously difficult games speaks for itself. I just feel like Furi doesn’t reach its full potential because it drags the boss fights out for too long and the heavy pattern memorization style of the gameplay isn’t ultimately all that satisfying even when you do succeed. There is a lot that I do love about it like the core scenario and incredible presentation and I think the concept of a game that is all boss fights is awesome, but I just didn’t have all that much fun with it. More patient gamers with a high tolerance of frustration will likely enjoy it and should give Furi a try, but if you don’t fit that description you can probably skip it.